Weekly Photo Challenge: Silhouette | Oh, the Places We See . . . Staging a silhouette takes patience and good background lighting. But sometimes a silhouette appears unexpectedly. 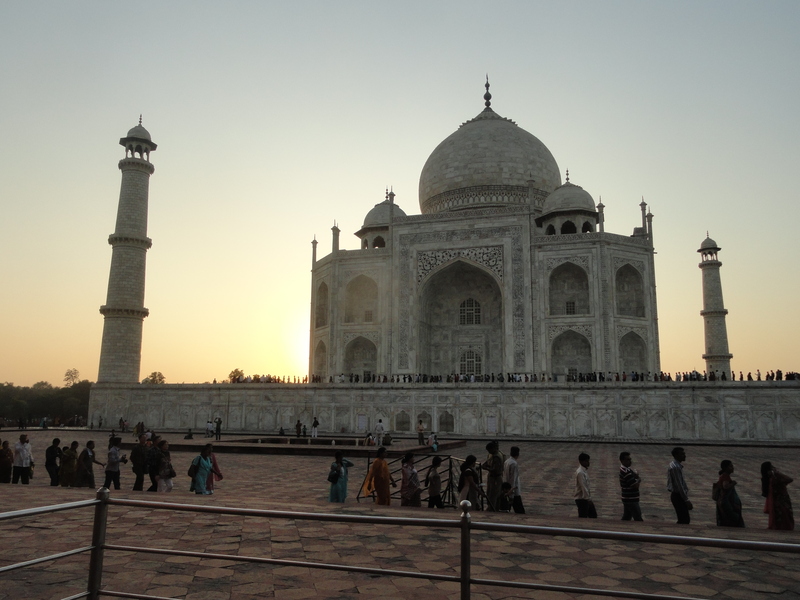 Like when we toured the Taj at sundown, right before closing time. We snapped a photo of the long lines waiting to snake around and up and around again on the plaza level, despairing as we noted the time remaining for our visit and how long it would take for a view from above. Then we made the inevitable decision based upon a statement we say frequently: Oh, well. Can’t do it all. And, camera in hand, we snapped away at those fortunate enough to view the setting sun from one of the world’s most famous structures. The result for us down below? A couple of unexpected silhouettes and great memories of an oh-too-short-but-fabulous-anyway visit. For more entries into the WordPress Weekly Photo Challenge: Silhouette, click here. 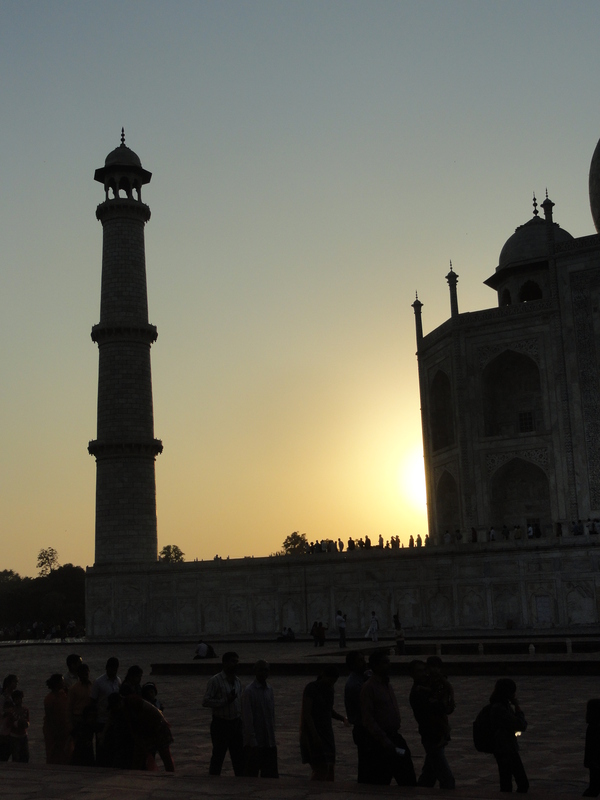 This entry was posted in India, Photography, Travel, Weekly Photo Challenge and tagged India, silhouette, Taj Mahal. Bookmark the permalink. What a good attitude and I love the last picture! Thanks so much for reading! 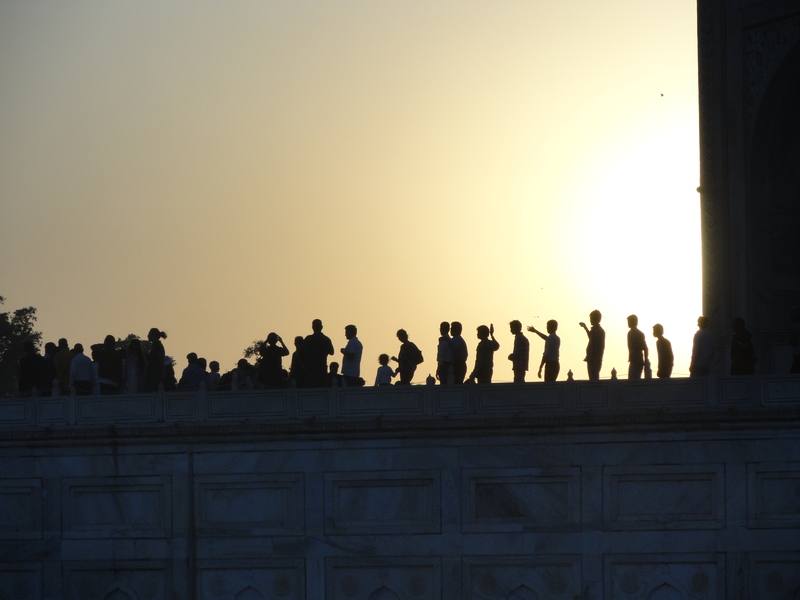 The last picture is one of my faves from the trip — all those people loving their view of the Taj — and we got to see both — the people and the famous place. Not only is this an excellent photo but I love the story behind it. Isn’t that the way when traveling we just have to make some decisions about how much we can do. Unfortunately, it is the way — never enough time to see all there is to see. I feel the same way about restaurants. Even if you did eat three great meals a day, you just can’t get around to all the recommended eateries! Thanks for reading! Happy travels — no matter what you get to see. Thanks so much. I wish I had had my newer camera, but at the time I only had an iPhone. Still, the composition trumps the sunset color — and I loved the experience. Thanks for taking a look. Appreciate the comment, for sure. I loved being there and capturing several sights that I never dreamed of seeing — silhouettes being among them! Thanks so much. I wish I had had the camera I have now instead of my trusty iPhone only. But actually, the memory of that afternoon is still with me, no matter what the device! Beautiful photos, Rusha. I think these may be some of my favorites. Thanks!!! It was great being there — and I wish I could go back, especially at sunset.